Capcom has released two videos showing the first set of eight new characters available for Mercenaries mode in the upcoming Resident Evil 5: Gold Edition and DLC. While the characters aren't new, Sheva and Chris return in alternative costumes and weapon loadouts. Chris is all dressed up in an warrior outfit that sports leather straps, sunglasses and spikey shoulder pads. 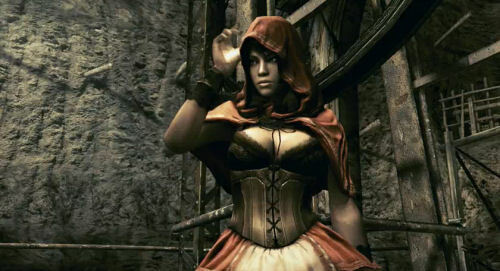 Sheva on the other hand is in the folklore outfit, which kind of looks like a slutty Red Riding Hood Halloween costume. Resident Evil 5: Gold Edition will hit the US on March 9th, and Europe on March 12th for $49.99. The DLC will be released starting February 17th until March 4th.